Hypalon is a special rubber sheeting and a registered brand of Dupont Performance Elastomers for a high-quality, particularly weather-resistant elastomer. Hypalon is resistant to ultraviolet radiation, ozone, oxygen, discolouration and weathering. This makes it weather-resistant and suitable for use in the open air and many other applications with a maximum temperature resistance to about 130°C Hypalon is good resistant to water, acids and bases, but less resistant to hydrocarbons, aldehydes, esters, or ketones. Butyl rubber or IIR ( Isobutylene isoprene rubber ) is extremely air tight. For this reason it is almost always used in tires but also applications such as gasmasks or medical sealants require this quality. 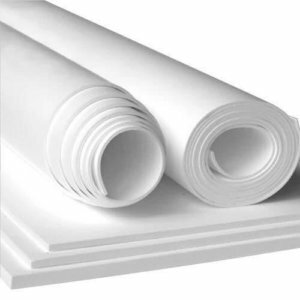 This butyl rubber sheeting has an excellent resistance to OZON & UV. Teflon or PTFE is an ethylene polymer in which all hydrogenes atoms have been replaced by fluorine. The polymer is one of the largest molecules due to it’s large length. PTFE is a thermoplastic, but it cannot be processed in a thermoplastic way. Teflon in sheet or rods are been pressed into a mold as a powder at room temperature and then sintered in an oven. Teflon can be used for food applications.